Brach's classic jelly beans. Brach's is known for their sweet chewy jelly beans. 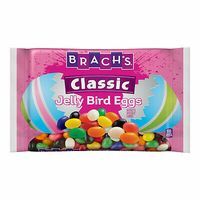 The classic jelly bird eggs come in an assorted bag of all your favorite classic flavors. You get an assortment of black licorice, cherry, grape, orange, lemon, lime and strawberry. Brach's jelly beans have a flavor like no other. These are perfect to place not only in your Easter Baskets and candy dish but also to use when decorating your Easter cupcakes.